“The smartest person in the room is the room,” according to David Weinberger’s Too Big To Know, published in 2012. I heard this quote somewhere in the ether and have thought about it before every lesson I teach and presentation I make. 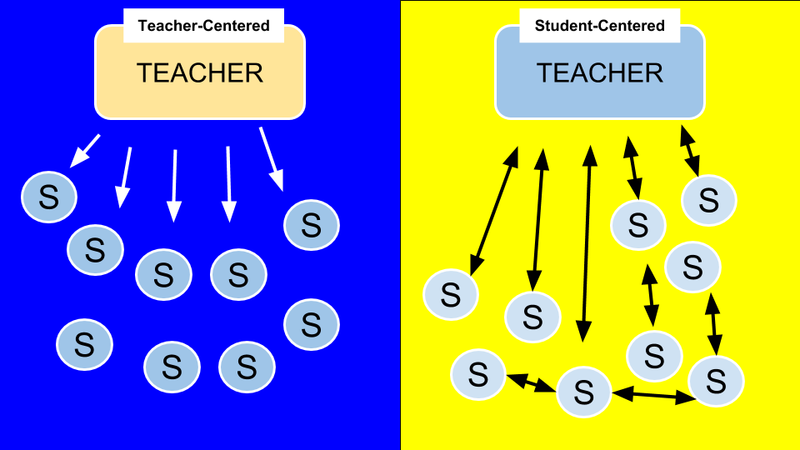 Placing every student’s knowledge and effort at the center of the lesson is ultimately the goal with student-centered learning. Learners, by design, will spend most of the time using content they chose to answer their own need-to-know questions. The teacher plays moderator, facilitator, and coach, which is a departure from the “sage on the stage” approach that many traditional teachers still perpetuate. (2) How will I collect the information from the audience and visualize it in the moment? It’s important to think about the concept, not the tool. The concept may be collecting written work, images, or a poll, to name a few. 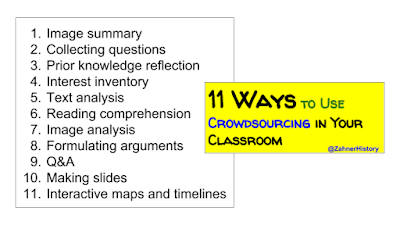 Depending on the nature of the activity, you can choose a tool or a series of tools to facilitate the crowdsourcing process. I tend to choose tools that allow students to provide the content and continue to work with it. This often means that students can see their peers’ work, so it’s important to be sensitive, as needed, and to capitalize on the cooperative learning experience whenever possible. This list of crowdsourcing ideas below is based on making thinking visible and other strategies that work well on paper, too. Each one is explained with the hopes of opening new doors through connected classroom technology. The tools are important, but they are not as important as the reasons for using them. One of the biggest reasons I use connected tools is how it takes making thinking visible to a new dimension. When students use the tool and provide their response, their work, or whatever it is that I’m gathering, they can see each other’s work and learn from peer contributions. These strategies and use of tools also support expanding every learner’s audience, which is the most critical piece of student voice that we should not forget. Students who perform for more than the teacher, perform for themselves and their closest communities, such as their peer group in the classroom. Google Drive folders can be shared via link or through a direct share. This allows students to add content for the lesson, which, in and of itself, is a critical lesson activity filled with opportunity to learn and practice technology and content-related skills. Most importantly, placing the specific content artifacts in the hands of the students supports choice, giving them a voice in the content they will study. Students share images that summarize all or a part of a problem, essential question response, or an enduring understanding, for example. The teacher can see their progress and either begin to rename the images, or the next step can be a whole class discussion – led by the teacher or a student – about how the images should be labeled. To take a closer look, students can be assigned an image to then select and write about the specific evidence that could be used to support a response to the problem. They can use the commenting tools in Google Drive or Microsoft OneDrive to facilitate this part of the activity. Team Drive has been a huge time saver for my classroom. The only thing students cannot do in our Team Drive settings is move files out of a folder. This means they can make the files in the folder, and everyone has access to edit anything in the folder. It’s a huge step toward flattening the classroom walls, especially those that exist from one student to another. It also saves the teacher a lot of time not having to share so many folders or documents. Let’s say you want to do more with the images than simply add comments in the cloud storage. 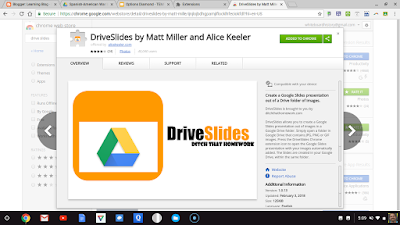 Drive Slides is an extension made by Alice Keeler that takes the images from a Google Drive folder and automatically places each one on a separate slide. This could set up the class to add their paragraph summary to the speaker notes and use the print settings to make a quick set of wall hangers for a gallery walk activity. Whether you use Google Drive or Microsoft OneDrive, the strategy and steps of the activity are the same. Both tools can share folders to students who can then upload content and make comments on each file in the folder. My school uses Google, but if it told everyone tomorrow that next year we are Microsoft, my lessons would still hold up. This activity would still work if I gave kids scissors, a pile of old National Geographics, and several pieces of chart paper around the room. It would just take longer and it would be harder to manage the record of the project. But, to balance tech use, the paper-based approach works, especially of you take photos of the work and drop the photos in the cloud for further study or presentation. The importance of Need to Know Questions cannot be overstated. They are the most fundamental way to make thinking visible and drive inquiry on both the individual and classroom levels. Forms and survey tools are a great way to collect questions. When it comes to choosing one tool over another, it’s important to consider what you will do with the responses. If the response is it just to be used for a class discussion facilitated by the teacher, tools like Poll Everywhere, Mentimeter, and Padlet work great. If students will be looking for patterns in the responses, sharing a sheet with the responses from a Google form will facilitate that process much better than the previous tools mentioned. Here's a post that explains how I collect and share responses for students to use for an inquiry foundation. Students contribute these questions to the group to move learning toward formulating responses and solutions to problems. Moreover, these questions are the inroad to making new connections and the basis of learning, regardless of whether it’s student-centered or teacher-centered. Vocabulary lessons are a great way to build background. The problem is that we often have more words to teach than time with our students, and not every lesson can be about building background through vocabulary. The problem isn’t really the amount of time we have to teach new terms and concepts. It’s the struggling through a lesson based on a lot of guessing. Pretesting can provide teachers with the information that informs the planning process, so how can technology facilitate this formative process? How can the pretest become an important part of the learning process for the students? 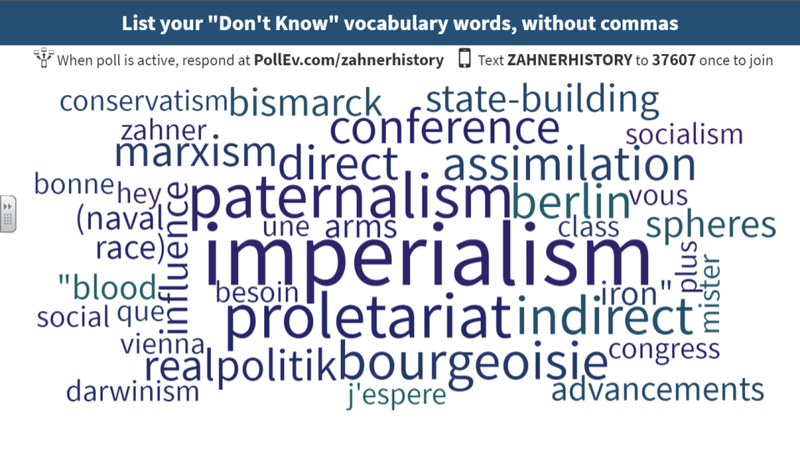 Tools like Poll Everywhere and Mentimeter have word cloud generators built into to their presentation view options of the audience responses. I take a simple sorting strategy – words I know, words I think I know, words I don’t know – to figure out the the pressing need of the class. 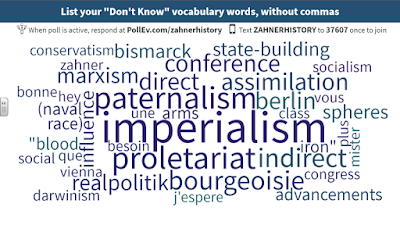 Students complete sort on an individual Google doc and paste the “don’t know” words into a poll that generates a word cloud. The lesson then becomes about the largest words in the word cloud because those words are the most concerning for the class. And the assessment is driven by student reflection that ultimately determines how the teacher will allocate time. This is as student-centered as anything. 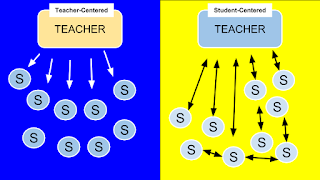 The only more student-centered would be if the words originated from the students and their own sources they found to help respond to a problem they chose. We often hear that choice is something that students should experience in their education, but it’s less often that you see what it looks like. I try to give students several opportunities to make choices when they do projects, and I’ve found that letting them choose organically is not always the best for them. 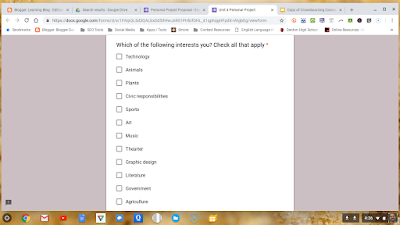 I call this Google Form an interest inventory because it helps students move from their interests to topics while deciding what to focus on for their project. Students select the checkboxes that apply to their interests before choosing the topic and the format to present. Here’s an example of this form in action. Like I said, I’ve given students opportunities to choose whatever they want, given a set of criteria to keep it relevant to the unit or lesson, and they often struggle. Providing lists of potential topics is part of establishing choice in student-centered learning. The best thing about the interest inventory is that it allows students to focus on how they connect to the lesson, which is a central aspect of student-centered learning. 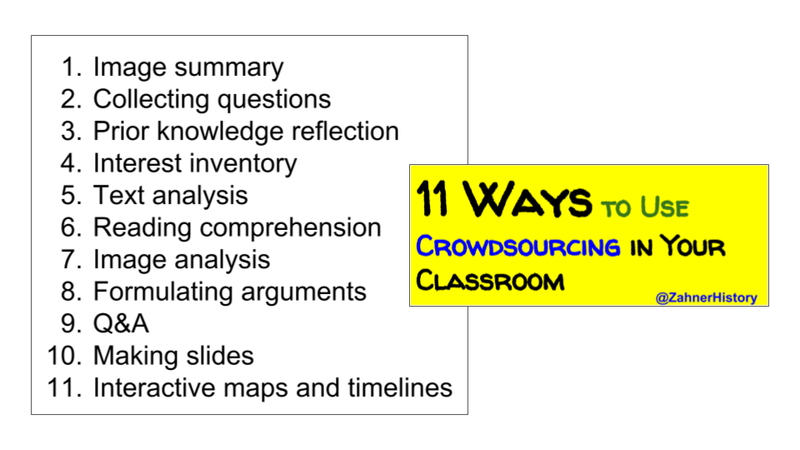 Crowdsourcing doesn’t need to include everyone’s response, but it’s great whenever possible because then it acts more like a formative assessment. 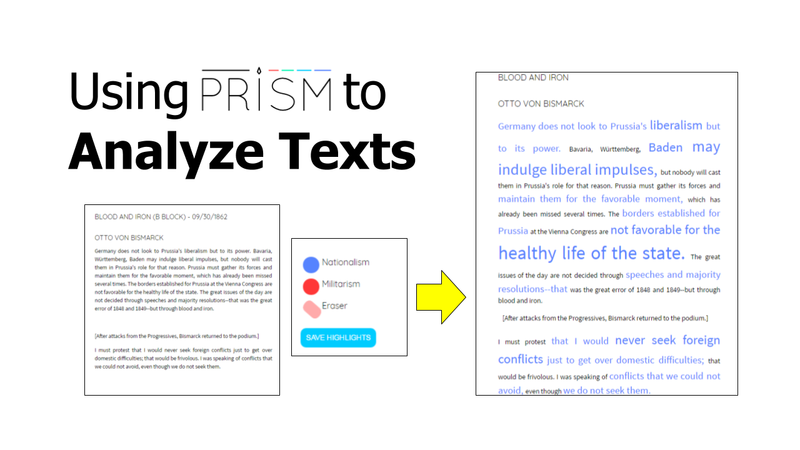 When it comes to text analysis, we often use Google Docs for shared notes or the comment tool in Drive if it’s a PDF. But those tools cannot visualize the group’s decisions. 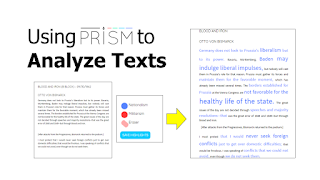 Prism is a tool developed by the University of Virginia Scholar’s lab. It allows you to crowdsource interpretation of a document. In one of the visualization modes, for example, the text becomes larger the more people highlight a word, similar to how a word cloud works. 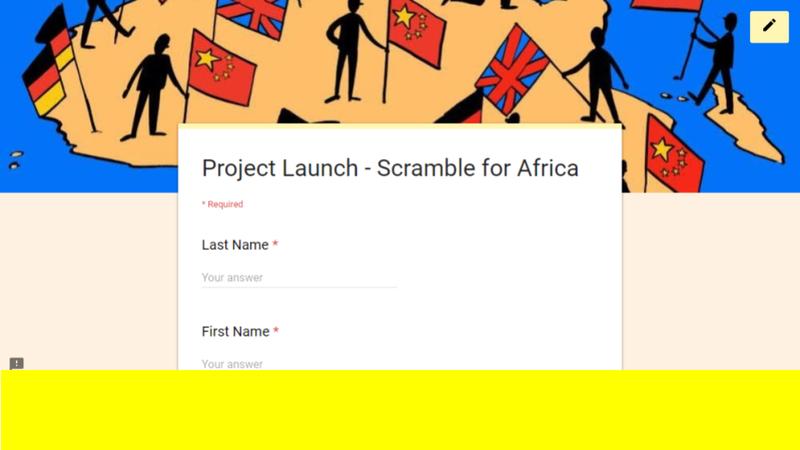 This is another activity that uses the Google Drive PDF preview comment tool. It can facilitate reading comprehension strategies like, questioning, predicting, summarization, and using text evidence to support claims. For prediction, I like to use an activity called first lines. Learners read the first line of each paragraph and make a prediction about the main idea of the paragraph. The comment tool can be used to write the predictions so all of the students can see everyone’s work. 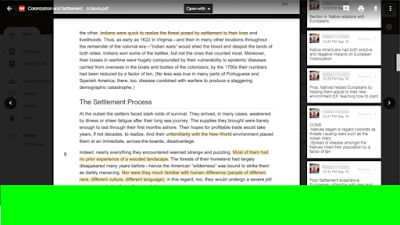 As students work in groups on a class shared reading, the teacher can monitor their comment posts and move around the room to support students as needed. Shared reading activities also work well when students are assigned roles. Such roles include, for example, reader, note taker, question recorder, and curriculum reviewer. 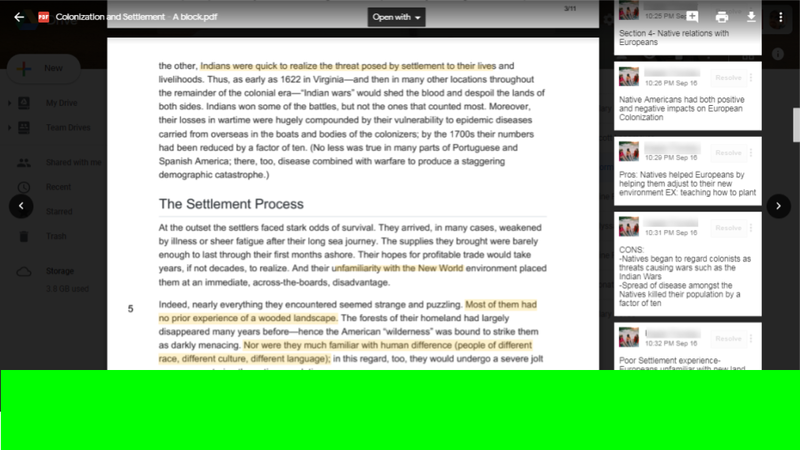 As the reader reads aloud, the other student roles can document their work with the preview comment tool. The Google Drive preview comment tool also works on image files. 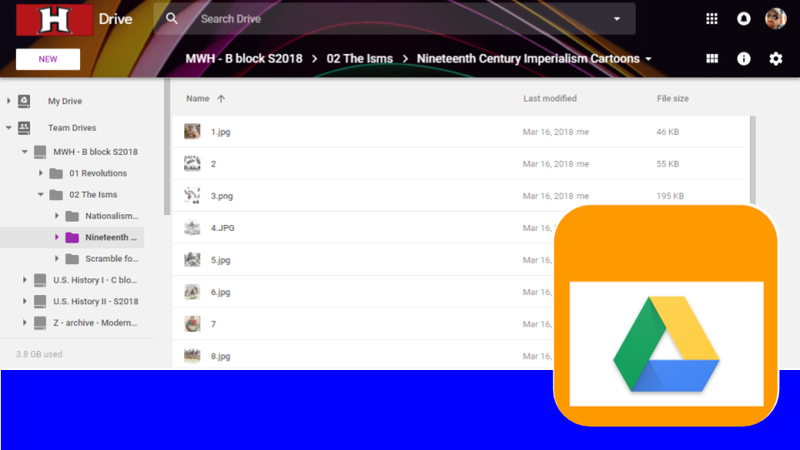 I often ask students to find images based on the lesson topic and upload them to a shared Google Drive folder where they can use the comment tool to add comments. Since the tool is used to select areas of an image, it facilitates analysis strategies that require students to find significant parts of an image, illustration, or cartoon. Students can then explain the significance of the part of the image. This type of activity works well as a rotation. Set the timer for 30 seconds and have them rotate from their previously assigned image. Half way through the rotation, change up the activity to move toward replying to the comments left by their peers. Making an emotionally safe space to learn is not easy. We want kids to take risks and learn from their mistakes, but they often feel judged and rated based on the content-based outcomes. These conditions make it especially hard to teach kids to be more constructive with their argumentative responses – a scary space filled with many potential correct answers. Verso App is a tool that protects student anonymity while providing teachers with the names of respondents. It’s perfect for allowing students to focus on the ideas and the elements of the argument instead of the person. 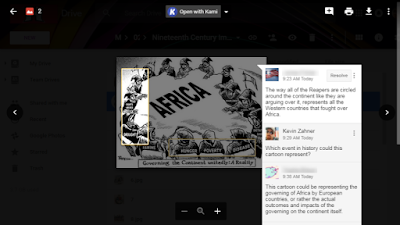 Teachers and students can add comments, click the like button, or flag responses or comments if they are unacademic. The progress report gives students engagement data, which is based on how many likes they receive on their comments. The idea is to reward constructive discussion. The Q&A tool is becoming standard for presentations. Google Slides has an audience participation tool, Poll Everywhere has a Q&A, and Mentimeter also has tool for receiving questions from the audience. These tools often have other features that allow audience members to up vote or like a comment or question. This sort of feature adds another level of participation from students because it engages them in the questions of the room, often their peers, and allows them to share their input when they may not have the confidence to be detailed about their concerns. 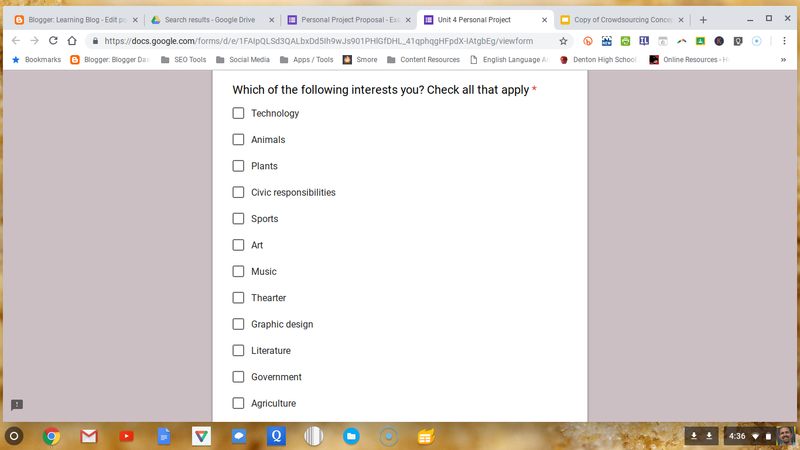 I like Poll Everywhere for Google Slides because it integrates well via an extension. This allows users to access their polls and make them a slide in a presentation without leaving Slides. Mentimeter integrates well with Microsoft Powerpoint, so I would definitely use it if I were not a G Suite user. Both of these tools have comparable features and get the job done well. Alan November says,“The world has enough PowerPoints.” Once upon a time, students needed to learn how to make slide presentations and the lesson stopped at that product. They had peer and teacher examples, but that’s about it. They didn’t have the vastness of the Internet that we experience today. Looking at how other people make presentations is a good way to learn how make better slides. Students (and many adults) need learn the conventions, and they can do so by browsing google images for clips from slides that are published on sites like SlideShare or SlidePlayer. Making new slides from slide clips on Google Images saves valuable time, exposes students to what other people are doing outside their school, and lets them compare different slide designs and content choices. You can make it a whole class activity by using the shared folder image upload explained in previous items on this list. Students can also rework old PowerPoints — we all a few hanging around, of course. This is a great activity to help teachers use what they have to make the lesson more student-centered. Instruct them to move the text in the slide to the speaker notes. 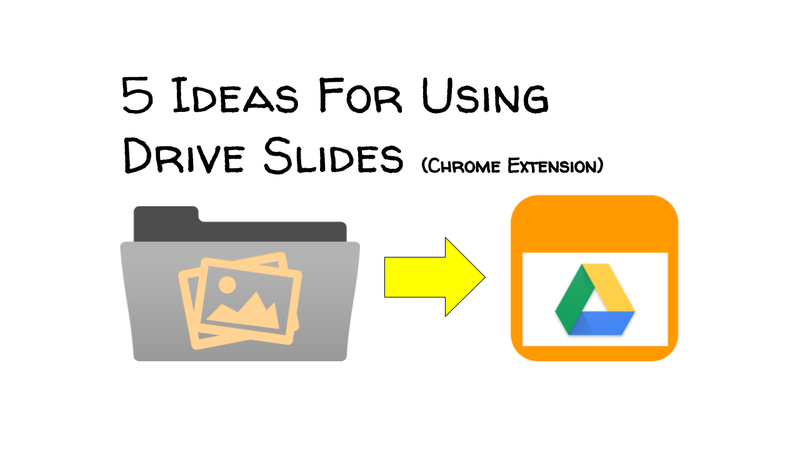 Students can find images that best go with slide. These lessons become more about the choices the students are making — the process — and less about producing a product that doesn’t hold the same value it once did, like PPT presentations for a grade. 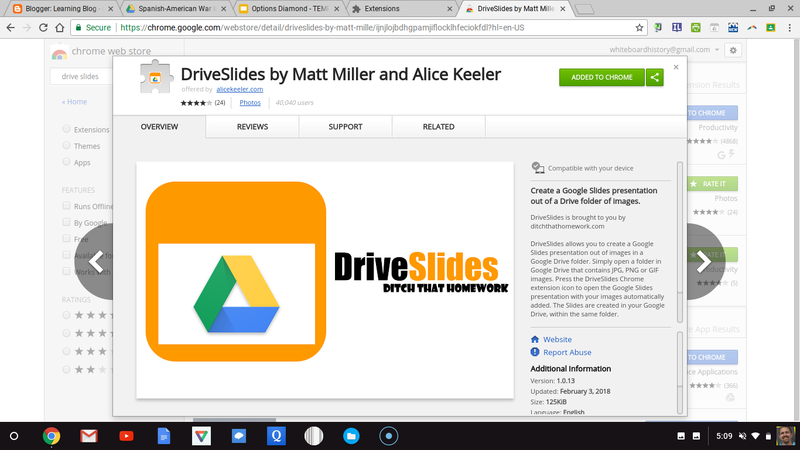 Check out this article for more ideas on how rethink the way you use cloud presentation apps like Google Slides. The process of making a slide presentation, map, or timeline, to name a few examples, teaches you far more than being an audience to one. So, why wouldn’t we just have students make this products and assess the learning via the process and presentation of the product? It saves time, and students are more engaged. Knight Labs has the best tools for making timelines, story maps, and other products with Google Apps. 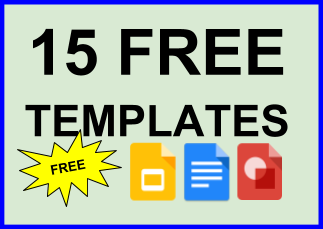 The Lab provides you with a Google Sheets template as well a the way to process it into a professional product for free. Try it out. The directions on the website are very straightforward. Here’s an example of a Knight lab timeline my students made. This article also includes some explanation as to how we made it. I’ve also see much success with Google My Maps. It’s a bit easier to use than the Knight Lab process, and the possibilities with mapping are limited by time and imagination. Try it with your math or science classes. I’m sure that mapping provides several opportunities to pull real data for the formulas and concepts you need to teach. If you have anything to offer about the strategies presented above, please share in the comments below. Also, please share questions, too. I will do my best to answer them, and sometimes your questions lead me to writing the next article.